15st 13lb, 1.8 units. I cannot swim a stroke. I always argue that this will prove very advantageous if I ever fall into the freezing North Sea, as it will ensure that I do not suffer for any length of time before perishing from hypothermia. The fishermen of the Northumberland coast traditionally did not learn to swim for this very reason. Lucker churchyard contains the gravestone of my great uncle James, who drowned off Bamburgh beach in 1891 at the age of 26, not long after safely completing an expedition to the furthest reaches of Dutch Guiana. The lesson we clearly absorbed was that swimming was a dangerous business. Neither of my parents could swim at all. Nor can my elder brother. But I had the advantage of a private education (albeit mostly kindly paid for by the ratepayers of Northumberland through the old direct grant school system) which included compulsory weekly swimming lessons. I kept those up for at least six years, until I became totally proficient at forging my mother’s signature on the letters excusing me from the classes. And, as I said, I still can’t swim a stroke. 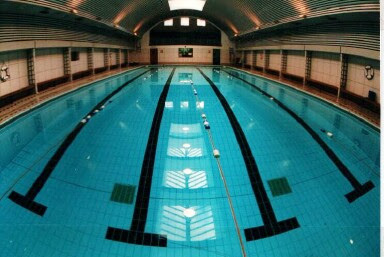 The Sutherland Swimming Baths. I gave £1,000 to the fund to knock them down, not realising that they meant to build a replacement. But I concede that I might have had more fun in life if I could. In particular, it has been one of the four serious impediments that have always cropped up at social events whenever anyone has suggested that it would be fun if we all stripped off and leapt into a swimming pool. The first and most critical of the aforementioned impediments is usually the absence of a swimming pool. Though there have been occasions when there were ladies present that I was so keen to see naked that I would happily have gone out and started digging one there and then. But for impediments two and three: my complete inability to swim and the fact that I possess a body best appreciated when it is completely clothed, and ideally (a) from a considerable distance or (b) through a stained glass window. The fourth impediment is that I am profoundly antisocial, and so have very rarely attended the sort of social event that tends towards skinny-dipping in its latter stages. Yesterday Mrs H took him to his swimming class and asked him at the end whether he had enjoyed it. “Getting out,” he replied, after careful thought. That’s my boy. As they say, it’s clearly all in the genes. This is potty training as a form of variety show, with the emphasis on magic. I wonder whether I could fund a comfortable retirement by selling the TV rights to Simon Cowell?